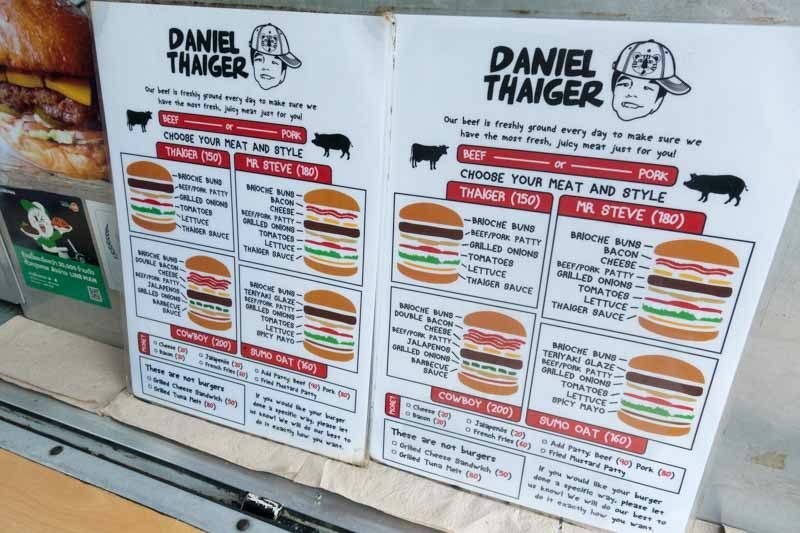 One of the highlights of my trip to Bangkok was Daniel Thaiger, a gourmet food truck that sells deliciously juicy burgers and In-N-Out inspired famous Animal Style fries, which don’t disappoint at all. 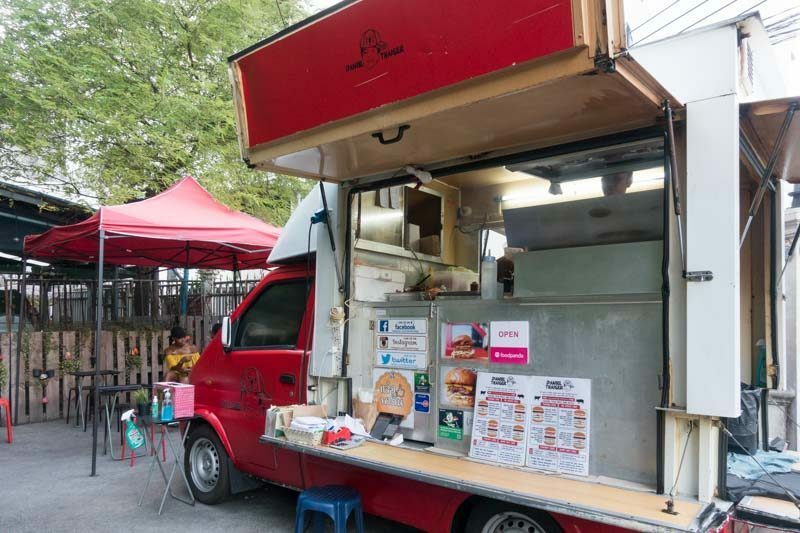 Situated along a tiny alley at Sukhumvit Soi 30/1, a mere five-minute walk from Thong Lo BTS, this mobile food truck prides itself on its fresh beef and pork patties which are grilled over an open flame, making them crisp on the outside and oozing with mouth-watering juice the minute you take your first bite. Initially, when we followed our phone’s GPS to the truck’s location, we were a little hesitant because of how isolated the alley looked. But the minute we stepped into the alley, it was the delicious scent of grilled meat patties and melted cheese that dispelled our fear. For those looking for a nearby landmark, it’s right behind the Embassy of the Philippines. Plus, the food truck’s bright red colour was difficult to miss. The seating area is pretty bare, to say the least. 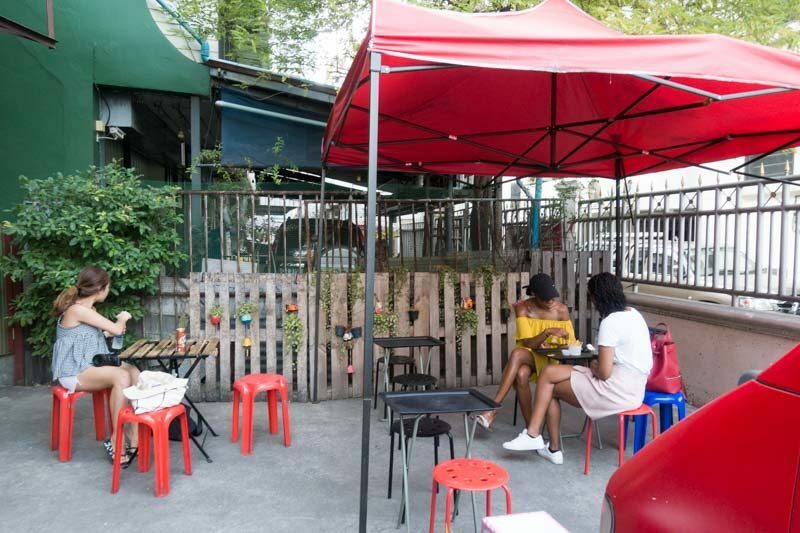 There are a handful of metal and wooden tables with plastic and metal stools for you to sit around and enjoy your burger. So if you’re looking for an air-conditioned eatery with proper seating areas, you’ll be disappointed. Do note there are a fair deal of mosquitos here, so bring plenty of mosquito repellent if you’re afraid of being bitten. One thing I absolutely appreciated about Daniel Thaiger’s menu was how simple it was. While the four burgers listed on the menu are pre-built, you can choose between beef or pork, with the former cooked to your prefered doneness. 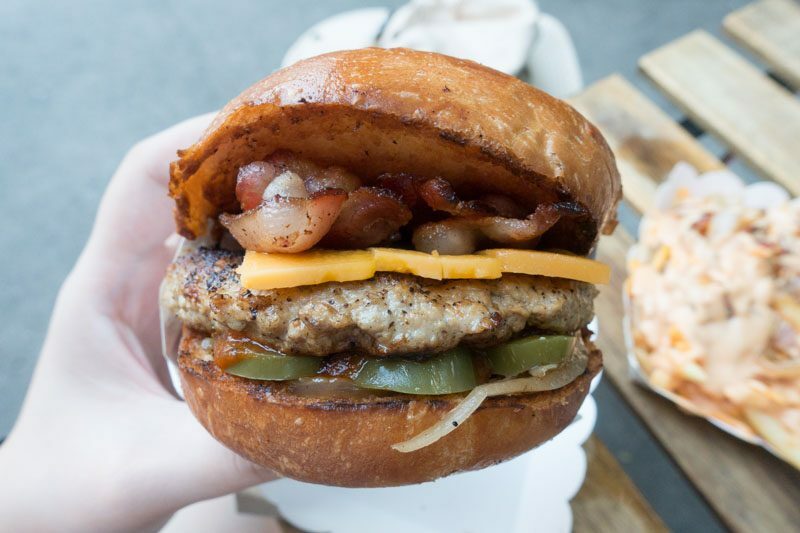 If you’re a big eater, be sure to get an extra patty (THB90 for beef, THB80 for pork) or choose between other toppings, such as cheese (THB20), bacon (THB30), jalapenos (THB20) or french fries (THB40). Fans of the American fast-food chain In-N-Out Burger will be happy to know that Daniel Thaiger has a similar Animal Style Fries (THB100) here as well that’s off menu. 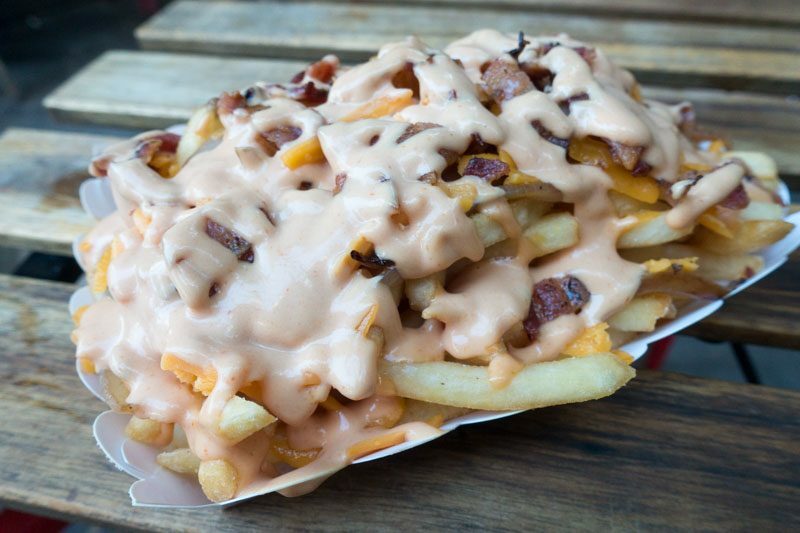 Just like In-N-Out Burger’s Animal Style fries, Daniel Thaiger’s rendition of this famous classic comes doused with a generous serving of creamy Thousand Island dressing, crisp bacon pieces and sweet caramelised onions. What’s different, however, is the addition of thick rectangular cuts of cheddar cheese. 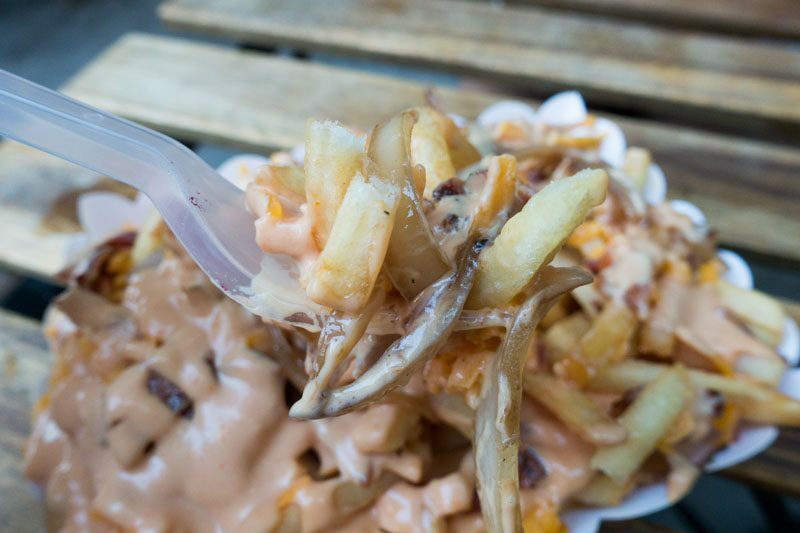 Though the fries weren’t fantastic, the sweetness and creaminess of the Thousand Island dressing were really addictive. Plus, the cheddar cheese and the caramelised onions added a tinge of pungent sharpness to each bite. The first burger we ordered off the menu was its Cowboy (THB200) with a pork patty. The burger came with a toasted brioche bun, double bacon slices, generous chunks of cheese, jalapenos, grilled onions and barbecue sauce. The first thing I noticed was how well grilled the brioche bun was. The surface was gleaming with a sheen, bouncy to the touch, and crisp to the point where a firm press downwards would’ve produced cracks in the shiny bun. The Cowboy burger was one of the best burgers I’ve ever had. Once I bit into the burger, I noticed how soft and fluffy the buns were despite being toasted generously on the outside. The pork patty was soft and juicy with a fine layer of peppery seasoning on top. The combination of bacon, melted cheese and sweet caramelised onions was fantastic, my only gripe was that the bacon slices were a tad too tough for my liking. The next burger we had was Mr. Steve (THB180). 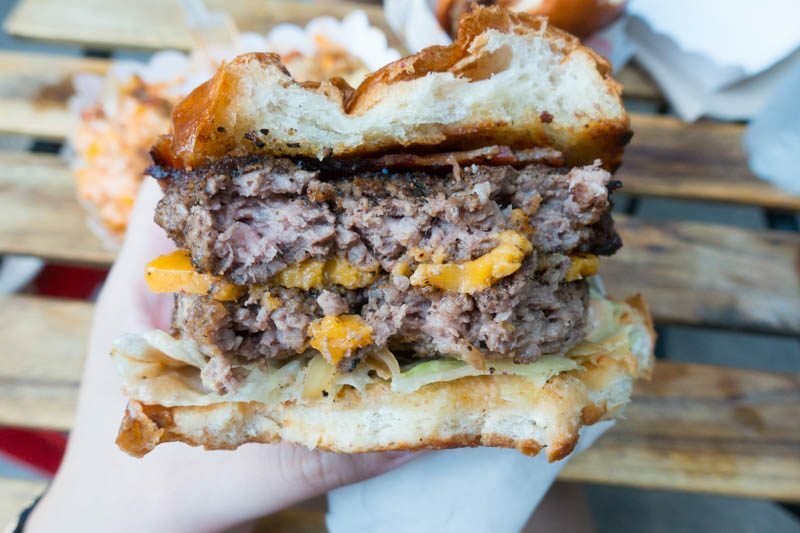 We chose the beef patty for this popular burger, and it came with bacon, cheese, grilled onions, tomatoes, lettuce and the special Thaiger sauce. 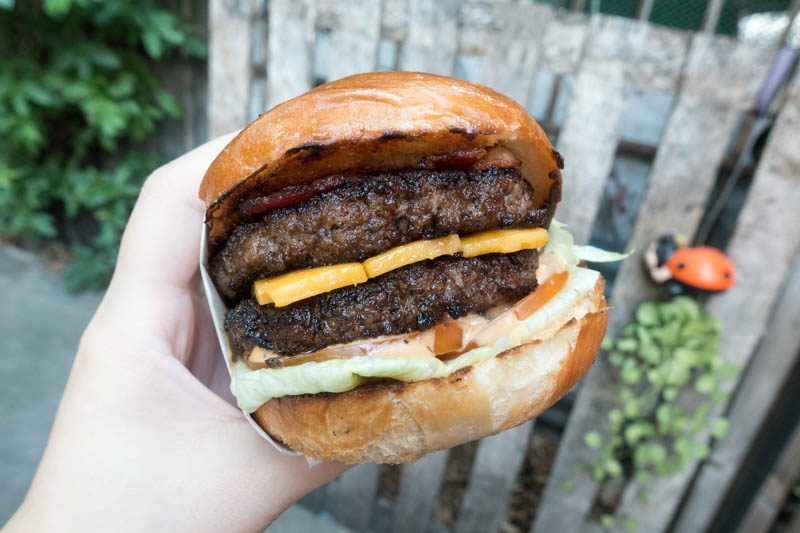 We were feeling a little more indulgent and decided to have an extra beef patty (THB90) with this burger. The first thing I immediately noticed was how chunky and meaty the beef patties were. They came apart in a glorious mess once I bit into it, a sure sign that the patties were handmade and assembled with fresh beef every day. 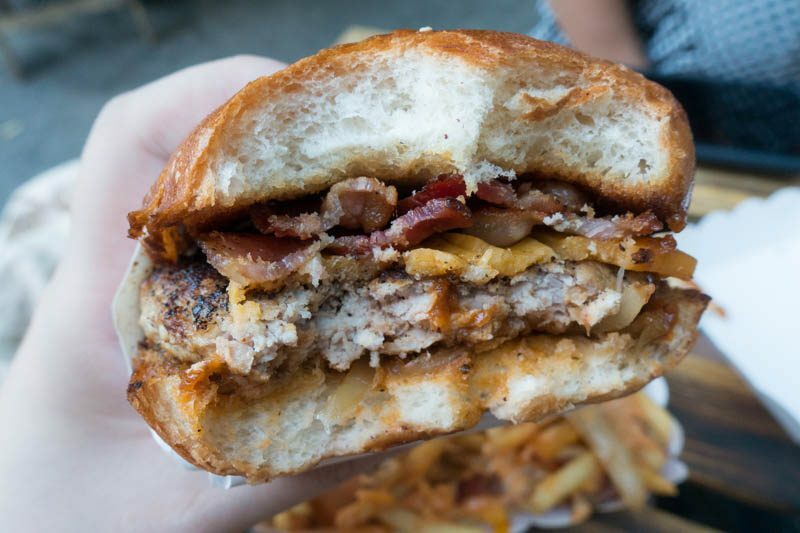 The patties were absolutely fantastic and the definite star of this burger. It was juicy, peppery and incredibly delicious. Boy, were we glad we went ahead to add on an extra beef patty. The rest of the components of the burger were pretty nondescript; the rectangular chunks of cheddar cheese were still firm when I bit into them and I wished they’d have melted a little bit more. The next time I’m in Bangkok and craving a thick, meaty burger, I’m definitely making my way down to Daniel Thaiger and ordering myself a Mr. Steve, complete with an extra beef patty and Animal Style fries. Though I spent a good amount of time swatting away flies while dining there, its burgers were definitely one of the best that I’ve had and they’re super worth the price. Perhaps the next time I’m there, I’ll consider tapaoing it instead so I can enjoy it from the comforts of my Airbnb instead. Do remember to check out its Facebook page prior to going down, as the truck might change locations or close on certain days.